BBQ Pulled Jackfruit is a dream come true for vegans, vegetarians, and anyone else who loves BBQ but doesn’t want the health risks that come with it. Smoked meat is TERRIBLE for the body. It’s a carcinogen on par with smoking cigarettes, which kind of seems like karma to me. We kill the pigs, they kill us. But BBQ tastes amazing! Every vegan and vegetarian I know misses BBQ sandwiches. Enter BBQ Pulled Jackfruit. It has a texture and flavor so realistic, it often fools meat eaters. Sweet, smoky BBQ with none of the cruelty, environmental damage, or health risks? Count me in! Fresh jackfruit is a large, spiny fruit native to Southeast Asia. I’ve never worked with fresh jackfruit before, I’ve heard it’s tricky! For this recipe, canned jackfruit does the trick. You can find it in Asian or Indian grocers, or at Trader Joe’s! Be sure it’s canned in brine or water- NOT juice. Some of the ingredients are specialty items, but can be easily found on Amazon and shipped right to your door. Alternatively, most health food stores carry vegan worchestershire sauce and liquid smoke can usually be found at regular grocery stores near the hot sauce. I source the canned jackfruit from the local Indian market in LA. (Best discover EVER.) I attempted this BBQ Pulled Jackfruit recipe without the worchestershire and liquid smoke and it was nowhere near as delicious. A small jar of each will last a long time, consider it an investment in your taste buds! 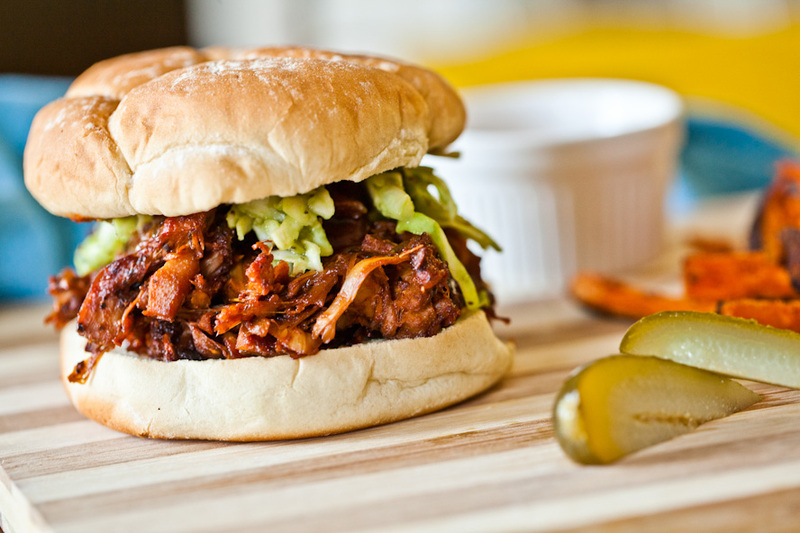 I recommend doubling or even tripling this BBQ Pulled Jackfruit recipe. Trust me. It makes 4 large sandwiches, but you will want leftovers and the BBQ Pulled Jackfruit tastes incredible even when it’s served cold. For other yummy vegan sandwich recipes, check out our Chickpea Salad Sandwich or our Mac Daddy Vegan Breakfast Sandwich! Juicy, chewy, PERFECT Vegan BBQ Pulled Jackfruit Sandwiches. So delicious, most omnivores can't tell the difference. Topped with creamy avocado slaw for the ultimate vegan bbq sandwich. In a large skillet, heat the oil on medium high. Sauté the onion for 1-2 minutes until it becomes slightly translucent. Add the garlic and cook for another minute or two. Stir in the jackfruit, then add the vinegar, molasses, worcestershire, liquid smoke, and dry spices. Mix well. On a lined or greased baking sheet, spread the jackfruit in an even layer. Bake in the oven for 20 minutes, then take the pan out and pour the bbq sauce over the jackfruit. Stir well until evenly combined and if desired, use a fork to shred the bbq pulled jackfruit even further. The smaller the pieces are, the chewier and more delicious they will be. Place the pan back in the oven for another 20 minutes and get to work on the avocado slaw. (Recipe below) Assemble the sandwiches with a large scoop of bbq pulled jackfruit, avocado slaw, and a drizzle of bbq sauce. For the slaw-In a large bowl, combine all ingredients and mix well. Place the avocado slaw in the fridge to keep it cool until the BBQ Pulled Jackfruit is ready. Can this be made with fresh jackfruit ? Hi Rebecca! We have never worked with fresh jackfruit before, I believe it would be much more labor intensive and may not taste as good. If you try it, please let us know how it turns out! Can’t wait to try this. I’ve wanted to try Jackfruit, but have hesitated. I found it at Whole Foods last week and bought some so this weekend, with all my kids (who aren’t vegan) I’m using this recipe. Sounds yum! Hi Paula, that is excellent! Thanks for checking out our recipe. 🙂 I bet your kids will love this sandwich, it is a crowd pleaser for sure! Please let us know how it turns out! Thanks for the suggestion Marni! I’ve seen many other jackfruit recipes use that method but the baking is what gives our recipe the excellent chewy factor that makes it so special and so delicious. If you can spare the extra time, I highly recommend giving it a shot!